They say they found the Holy Grail a few weeks ago. And it was hiding in plain sight. Now I don’t know a lot about the search for the Holy Grail. I know that it has motivated searchers for centuries by now --- rooted in the time of the Legend of King Arthur and coming alive now in many or our memories on the big screen in the danger laced quests of Indiana Jones. Two historians claim the search for the Holy Grail is over. 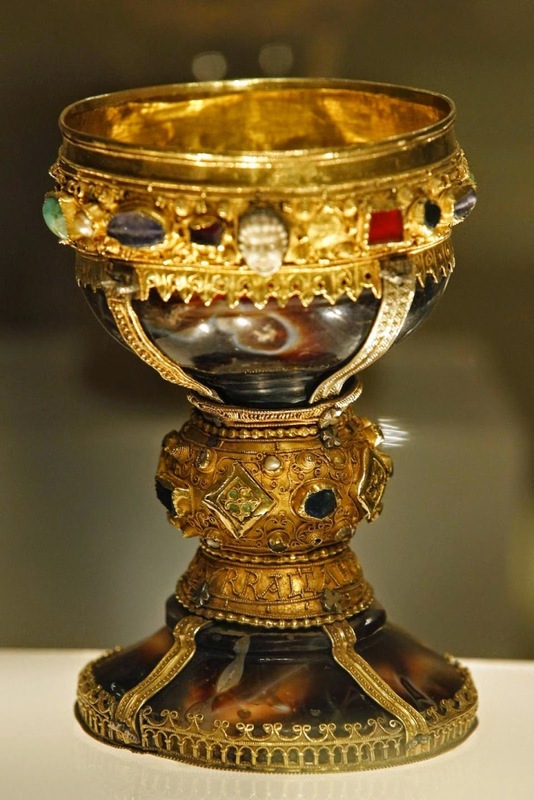 The famous cup used by Jesus during the Last Supper was identified in a book written by Margarita Torres Jose and Manuel Ortega del Rio titled "Kings of the Grail" and published last week, as the jewel encrusted goblet on display at the San Isidro Basilica in the Northwest Spanish city of Leon. Now for the sake of full disclosure, let me say that I have always been skeptical of such announcements and the science/history that lays behind them. When the news story first caught my eye, the "Holy Grail" as pictured there had me shaking my head immediately. I simply knew there was no way an ornate cup like that would have been used by Jesus as he spoke to his closest followers saying, "This cup is the new covenant in my blood." If you read deeper into the story, however, you will discover that the theory is that the gold and jewels were added later and that they cover up a more plain cup made of onyx --- of the sort that possibly could have been used in the time of Jesus by Jesus. Even so. As I understand it, any "proof" of this connection is based on ancient testimony, much of which was not recorded until centuries after this Holy Meal was shared. And to simply place it in the approximate time of Jesus, does not necessarily place it in his hands on that fateful night. So yes, I am skeptical. And even if it was the one, I wonder, what would that finally mean? And yet, there is something about ‘objects’ which tie us to one another don’t they? I think, for instance of the time that I got in a bidding war on Ebay for a high school football program circa 1946 which had my dad’s name listed on the roster along with his relatively small height and weight. I wanted that program with all my heart. For it tied me to him, somehow, even though I knew he never would have laid hands on this actual program, still it stirred up the stories his brother still told of his big brother's fierce presence on the field and has us wondering, even now, if his determination and strength were passed on to us. Or I think of the plastic garbage bag of lace tablecloths I rescued from the garage sale pile at my mother’s house last summer. It was those same lovely cloths which graced our festive family meals. At Thanksgiving and Easter and Thanksgiving and Birthdays, Mother would have us lay them on top of the solid colored cloth which covered our table set for six or eight or twelve or however many would be pulling up their chairs that day. Its presence there reminded us that the one we were about to share was an especially special meal. Set apart from the hundreds of other family feasts we had shared at that same table. It didn’t seem right to just sell those tablecloths for they tie me to memories of belonging and laughter and joy. And so I set them aside. Only here is the truth. Those tablecloths are still in the bag. They’re not really my style and even if they were, I don’t entertain that much --- especially at holiday times – for those are busy work times for me. They sit in the bag where I plan, this week, to see if my sisters might like them. For they lose their meaning, their value, and certainly their purpose if they are not used, don’t you think? Which perhaps is why the quest for the Holy Grail and the possibility that we have actually found it leaves me just a little cold. For what good is a tablecloth that sits in a plastic bag? What good is an ornate cup which sits behind glass and which now has been put away out of sight until they can figure out what do with all the crowds which have come to see it now that its ‘true identity’ has been revealed? For that matter, just like those special objects which evoke our deepest, fondest memories --- what good are they if those memories are not somehow passed along in a way that can shape us and change us and make us all the more who we were made to be? Indeed, it seems to me that what makes the Holy Grail holy is not the cup itself, but what it actually held and could still hold. What makes it Holy is that passed from one to another in the sharing of a meal, it bound Christ’s disciples to Jesus and to one another. That it held the promise and gift of forgiveness. What makes it Holy is that in the wine poured out it pointed to the very blood of Jesus and to the sure and certain truth that the betrayal, and abandonment, and mockery, and suffering and dying that Jesus would do would be done for you and me and all the world out of a Holy love. And that, finally, even all of that would not have the last word. What makes the ‘Holy Grail’ Holy is that the gift it held so long ago is now and will always be ours to receive and to share and to be changed by even now. And that means it that the Holiness that matters is not confined to one jewel encrusted goblet in a museum in Spain. Oh no, what this means is that every chalice which graces every altar, around which God’s people gather, every time we do so, is especially Holy. For God is still working in and though this very bread and wine, transforming lives. And that is Holy. For it is not the cup itself which gives this night meaning. It is not even the fact that a special meal was shared by an itinerant preacher and his followers so long ago. And no, it is not really about what was on the menu that night, but rather the meaning and the purpose which was attached to bread broken and wine poured. Indeed, it was what came about later that night and in the days that followed which deepened the meaning of that the cup. Oh yes, what makes it Holy was and is the certain truth that we gather still to repeat and share this story of this one meal and now to feed one another bits of bread and sips of wine. What gives it meaning is that this sparse meal still feeds us in all the ways that matters. Perhaps they did find the ‘Holy Grail’ a few weeks ago. And if that is so, it surely holds some meaning for all of us who look back in these Holy Days to the gathering where it would first have been passed around. Only its meaning doesn’t rest behind glass in a museum in Spain. Its meaning lives with and for all of us and for all of the world whenever bread is broken and wine is poured and forgiveness is shared in Jesus' name. In fact, it is so that for you and me, it seems to me, it was never really lost. It’s been right out in plain sight for us to see and share all along. What do you make of the Holy Grail being found in a museum in Spain? Does this possibility deepen your faith or not? Why is that? Can you think of other things --- tangible or not --- which people seek with a desperate single mindedness? Can you see how they might 'tie us to one another' across time and space? What makes this special meal Holy for you? What is it that you hope to receive when you receive the bread and wine once more this week? Thanks. This really got me thinking and praying about what I want Maundy Thursday to be for me and the people I serve.